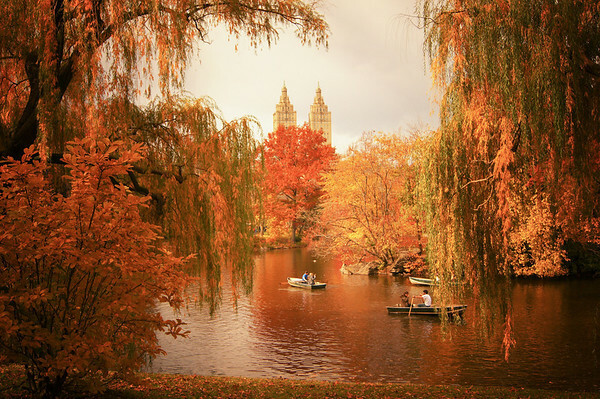 There are days in Central Park during the autumn when the weather is deliciously ominous. These are the sorts of days when grey clouds do their best to compete with the sunlight for the spotlight. I love the quality of this sort of contrasting light. During moments when the sun does manage to peek through the gray blanket of clouds, the foliage seems to reel in the bits of scattered sunlight. This is a vista that seems to come alive in the autumn and winter due in part to Central Park’s beautiful willow trees. There is a quality to the placement of the branches that is reminiscent of theatrical stage curtains in a persistent state of dramatically opening to reveal the landscapes that are just beyond their grasp as if they are revealing a show that comes alive in the final two acts of a performance that spans a year. In the autumn, these sorrow-soaked branches frame the sprawling autumn landscape that surrounds the lake and in the winter when the lake is covered in snow, the same branches hold multitudes of icy tears framing the towers of San Remo perfectly.